What we want from the historian and the journalist is easily described, though achieved with difficulty. We want an account that provides an accurate and truthful narrative of the events, based on the best available factual and historical information. We want an account that avoids the biases of the actors, including especially those of the most powerful actors who have the greatest capacity to shape the story -- the government, the military, and the major parties. We want an investigator who is able to question his/her own initial assumptions -- sympathy for the underdog, patient acceptance of the government's good intentions, or whatever. And we want a narrative that provides a balanced synthesis of the many events of the time period into a storyline with a degree of coherence: what the major events were, what choices were made by the actors, what the motivations of the actors were, and perhaps -- who acted responsibly and who acted recklessly or out of narrow self-interest. It has to be acknowledged at the start that there are often multiple truthful, unbiased narratives that can be told for a complex event. Exactly because many things happened at once, actors' motives were ambiguous, and the causal connections among events are debatable, it is possible to construct inconsistent narratives that are equally well supported by the evidence. Further, the intellectual interest that different reporters bring to the happening can lead to differences in the narrative: one reporter may be primarily interested in the role that different views of social justice played in the actions of the participants; another may be primarily interested in the role that social networks played, so the narrative is structured around network connections; and a third may be especially interested in the role of charismatic personalities, with a consequent structuring to the narrative. Each of these may be truthful, objective, unbiased -- and inconsistent in important ways with the others. So narratives are underdetermined by the facts. And there is no such thing as an exhaustive and comprehensive telling of the story -- only various tellings that emphasize one set of themes or another. That said -- it is entirely possible that a given event will have provided enough factual data in the form of witness reports, government documents, YouTube videos, etc., that the main sequence of events, cast of actors and responsibility for events are unambiguous. The example I'm thinking of in particular is the recent period of demonstration and riot in Bangkok involving red shirts, followers of former prime minister Thaksin, and the government and military. (See several other posts here and here.) 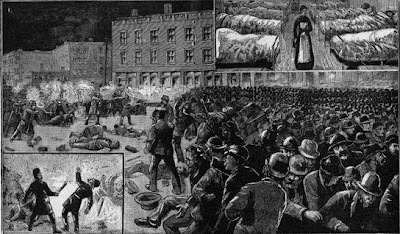 But other examples are easily found: the taking of the Bastille, the Haymarket Square riot in Chicago (pictured above), the return of Franco to Malaga, or the decision of General MacArthur to cross the Yalu River in Korea. Virtually every historical event is a complex happening; so the problems raised here are endemic to historical interpretation. One of the important issues being debated right now in Thailand is the question of arriving at a balanced and fact-based judgment of the amount of force that was used by the military in dispersing the crowds of protesters on April 13-14. The government reports that it used minimal force -- paper bullets, firm orders to fire above the crowds when using live ammunition, and a very low number of casualties as a result. Critical observers suspect a different story; based on memories of past repression by the military in times of street demonstrations, there is suspicion that the amount of violence was much greater. Some commentators speculate that there may have been many more deaths than have been reported and that the bodies were secretly taken away; ambiguous videos are brought forward as evidence for this possibility. So how are we to sort out the truth of the matter? We can raise the question of objectivity at two levels: the investigator and the narrative. So let's begin with the narrative itself -- what do we want in a good comprehensive piece of journalism that tells this story accurately and fairly? We want an account that lays out the causes, events, and actions that made up this period of several weeks of protest and reaction. We want to know what organizations and leaders took what actions at what time, to call forth what organized responses. We want to know what key decisions the government made. We want to know how the prime minister and the police and military deliberated about responses to massive demonstrations. We want to know how the several occasions of mob violence against officials and offices transpired. We want to know the crucial details of the final hours of confrontation between the military and the crowd, and the degree of violence that transpired at that point. And what do we want from the investigator of this complex happening in Bangkok? We want a commitment to arriving at the most truthful account of the story possible; a commitment to considering the full range of empirical and factual evidence available; and an ability to tell the story without regard to one's antecedent affinities and loyalties. It shouldn't be a "yellow shirt" or a "red shirt" story; it should be a factual story, based on critical reading and assessment of the available evidence. In order to arrive at such an account, the honest reporter needs to exercise critical good sense about the sources and the interests that the conveyors of the information have: the biases of the government, the press, and the parties as they provide evidence and interpretation of the events. And we want this account to be as free as possible of the interfering influences of bias and political interest. We want an honest and comprehensive synthesis, not a one-sided spin. The good news is -- both goals are possible. The standards and values associated with both good historical writing and good journalism lead at least some investigators to exert their talents and integrity to do the best job they can to use the evidence to discover the details of the story. Not all journalists are equally committed to these standards -- that's why we prefer the I. F. Stones to the Jayson Blairs of the world. But enough are committed that we've got a good shot at sorting out the realities and responsibilities of the complex happenings that surround us through their objective, fact-based reporting.